In 2012 when the bulldozer was digging Underhill house into its’ hill we had several requests of our excavator, Bruce Lease. Encourage water running downhill in the increasingly common torrential rains to course around and past, rather than through our house. 3. Level a terraced area big enough for a garden. From the start, that garden area has looked full of promise. It was topped with soil from an amazing source in a neighboring valley a few miles away where The Nature Conservancy was restoring a trout stream to its original pre-settlement banks. That meant excavating many feet of the topsoil that eroded from the hilltops when the early European settlers plowed up the prairie. The amazing provenance of that rich, black earth still gives me shivers down my spine. Every where we put that soil, plant growth has been extra lush. For fellow Tolkien fans, it reminds me of the little bit of soil Galadriel gave to Samwise, which he used to restore the Shire. To develop a mycorrhizal community in the garden, we have cover cropped it in rye to create channels for water and to incorporate fresh organic matter. 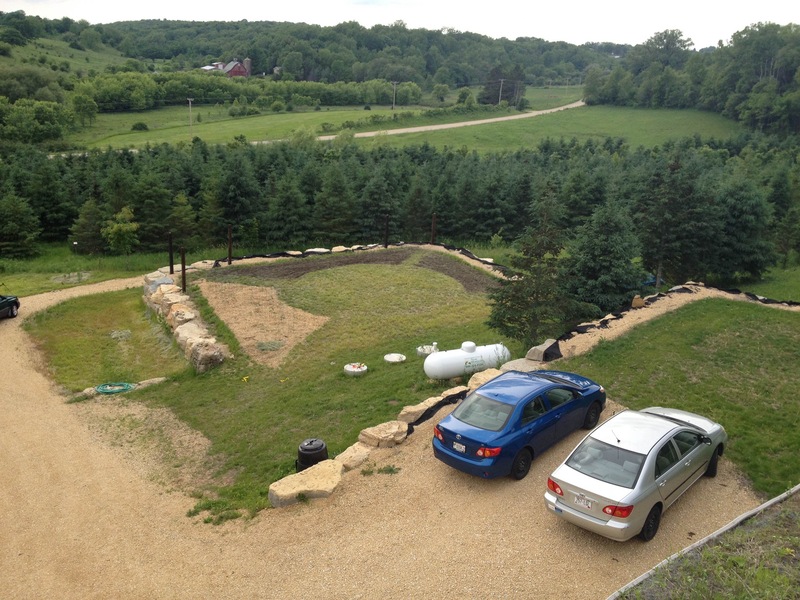 We also began to dream up possible arrangements of planting beds. The day we imagined laying the paths out in the shape of peace sign, we knew we had found our theme. We still needed one more thing. In the Driftless Area, we have an overwhelming deer population, who eat almost everything they encounter. We learned about their preference for garden greens the hard way last year. 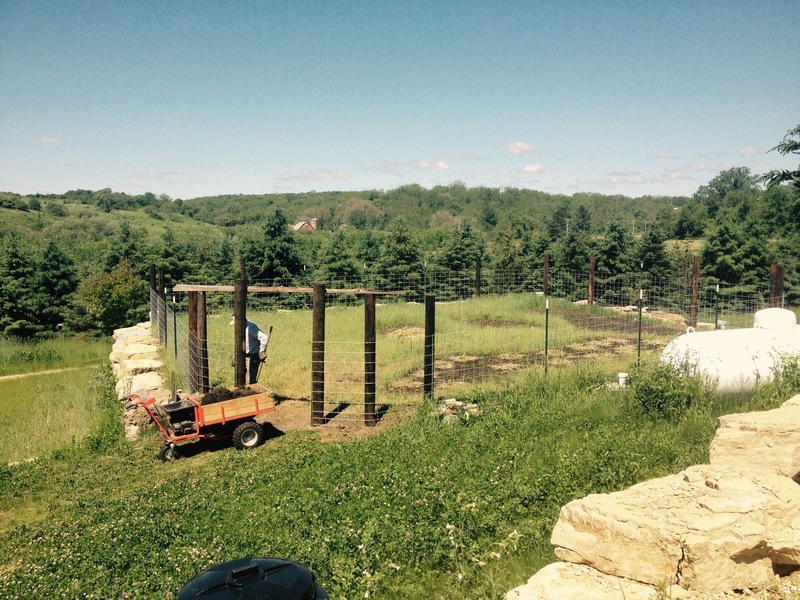 We determined to get a fence up for the 2015 growing season. It’s been a big job, but now it’s mission accomplished ! Deer are athletic leapers, so the fence has to be high. 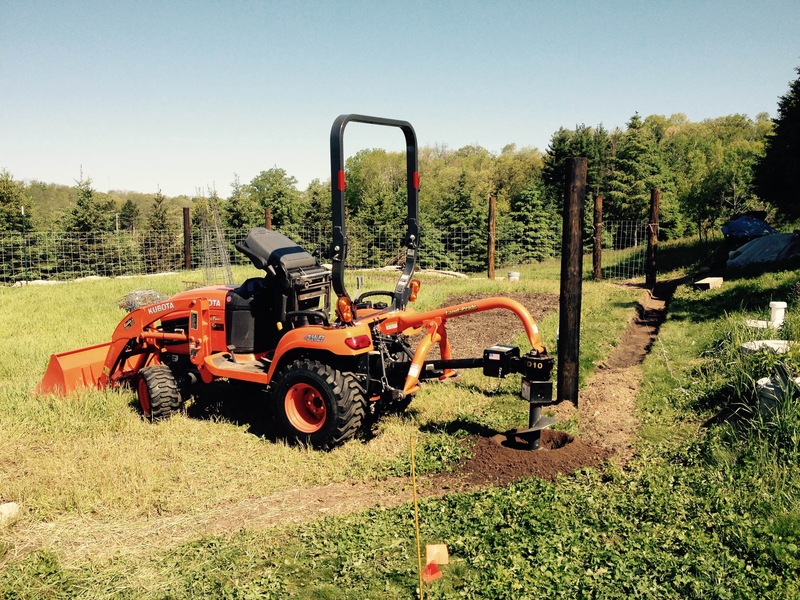 Doug chose 9-ft wood poles (3 feet in the ground – 6 feet out) augmented with metal fence posts in some stretches We decided to make the bulk of the fence with 16-feet long, 50 inch high cattle panels. It was a good, solid module and worked with the generally 8-foot spacing between poles. Of course, it’s 6×8-inch openings wouldn’t phase Peter Rabbit or his woodchuck fellow salad bar devotees, so the bottom three feet above ground and one foot under ground are supplemented with chicken wire. The necessary trenching has been some major earth moving done by Doug with a pick and shovel. 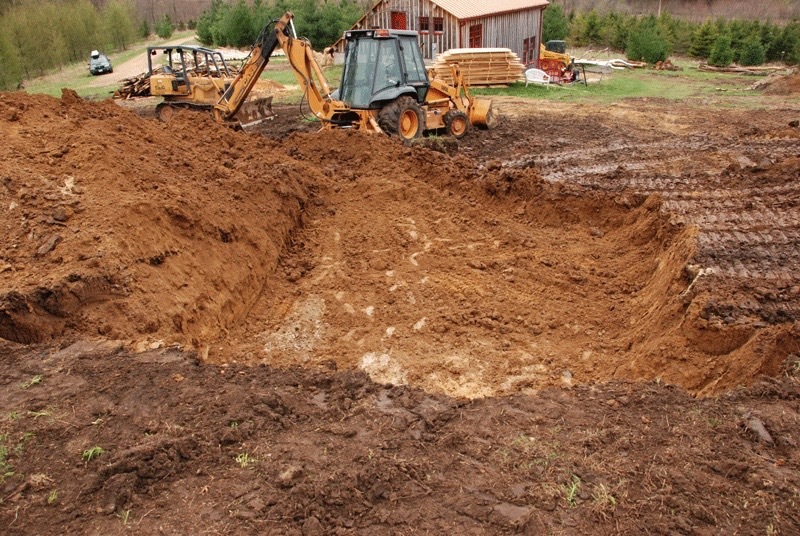 As for the post holes, he was able to dig out the first 2 feet with the posthole digger powered by our tractor. But the third foot, he had to dig out with a manual posthole digger. Doug dubbed the project “garden fence boot camp”, because over a three week period he turned belly fat into bicep muscle. excavating every non-rainy day (and some rainy ones) all the postholes and the foot-deep trench. 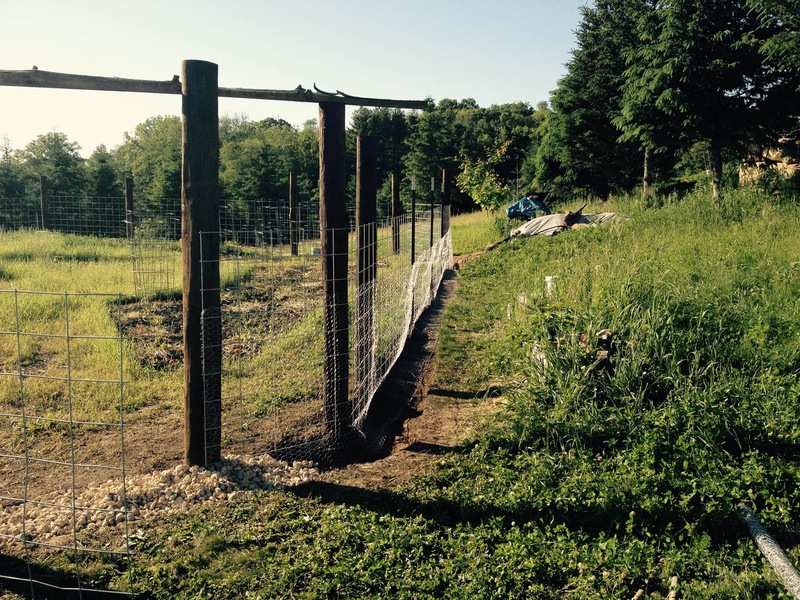 We still need to add a garden gate to replace the cattle panel remnant propped up against the entrance, and we will be adding a strip of white webbing at the top of the poles to discourage gymnasts among the deer herd from leaping the cattle panel. We are hoping this initial effort will let us start gardening unmolested. As Doug finished fencing, I started by scything the cover crop of rye, which I immediately put to use as mulch around the seedlings. It’s amazing how good it feels to work inside an enclosed garden. 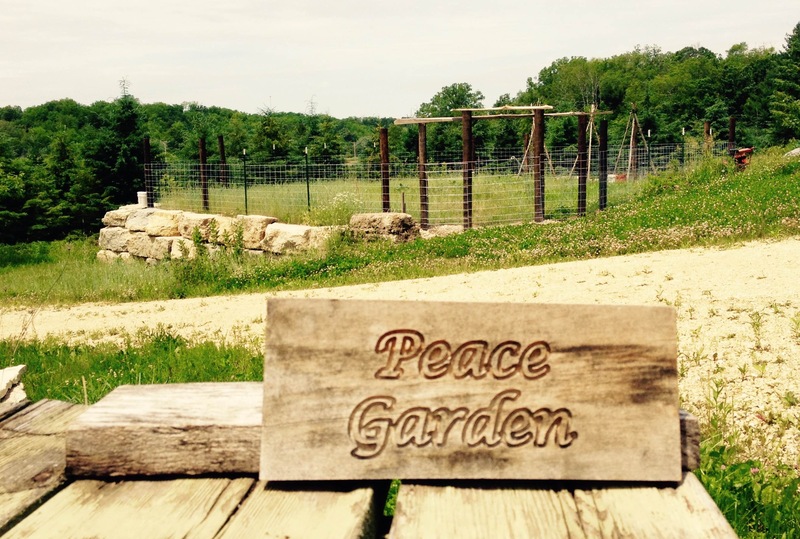 Because of the peace symbol pattern and the peaceful nature of gardening, we have named it -wait for it! – the Peace Garden. My friend, Susan, gave me this sign. 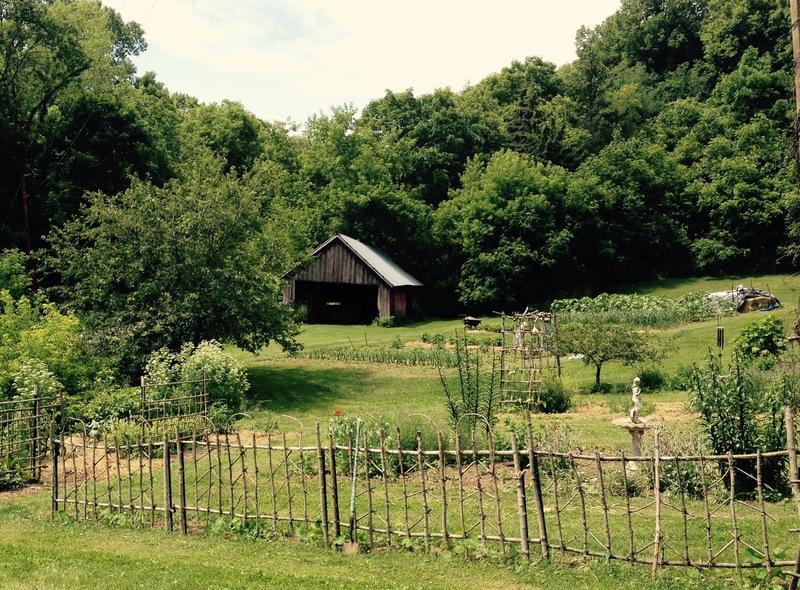 How do you lay out and protect your garden? My friend Susan creates the merest visual vestige of a fence shaped artfully of vines and saplings. It is beautiful but pest-permeable. She accepts that her four-footed neighbors will share her bounty. Another friend raised fortifications around her garden years ago that are supremely, almost dauntingly secure. Doug and fall somewhere in between, with fencing low enough to look over instead of looking through it, and plans for a more whimsical draped line higher up. Where do you fall on the garden fencing spectrum? Are your efforts to keep out the varmints meeting with success? Yes, farming on steep slopes presents its own challenges. We are working with a small field on a slope and have been going back and forth over whether to build berms along the contour lines to slow water down as it flows toward the bottom of the valley.